The wastewater system (sanitary sewer), contains service lines that flow from your property, to main sewer lines in the street, and eventually to the water reclamation facility where it’s cleaned and released back into the Poudre River. These pipes carry the water from your showers, toilets and sinks, which can become blocked if not properly maintained. Learn about customer responsibility and service line repairs. Utilities across the country are seeing an increase in sanitary sewer blockages, both on the customer side and in the main lines. A blocked sanitary sewer can lead to property damage and extra expenses for repairs. If you have a backup, call a plumber so repairs can be made as quickly as possible, as well as Fort Collins Utilities (970-221-6700) to report the issue and your insurance company for further direction. For more information: email V2FzdGV3YXRlci1TZXdlckBmY2dvdi5jb20= or call 970-221-6233. To report a blockage or backup, call 970-221-6700. The only things that should go down the drain are body fluids, toilet paper, soap and water. Wipes, feminine hygiene products, condoms, paper towels, facial tissues, diapers, makeup remover pads and dental floss don’t break down. Put these items in the trash. Video: Why Flushable Wipes Aren't Flushable. 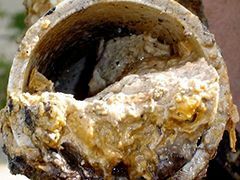 Fats, oils and grease (FOG) stick to the inside of pipes and harden like concrete. Do not put FOG down your garbage disposal. Tree roots can grow into pipes, causing leaks and backups. Customers in older parts of town or who have big trees are advised to work with a plumber for annual maintenance. Composting is preferred for food and coffee grounds. Garbage disposals should be used properly (see tips below). Keep hair from going into the pipes by using a fine drain screen in bathtubs, showers and sinks. Cat litter should be thrown in the trash. Remember, a garbage disposal is not a trash can—it’s for food scraps only. It’s also important to never put fats, oil, or grease into a garbage disposal, as they stick to the inside of the pipes and harden like concrete. Run a steady stream of cool or cold water into the sink before turning on the garbage disposal and continue running it until finished. Why cold water? It will cause any grease or oils that may get into the unit to solidify, so they can be chopped up before reaching the trap. Hot water causes grease to liquefy and accumulate and can cause drains to clog. Before placing any food waste into the disposal, turn it on first. Gradually feed food waste into the disposal, avoid putting in large amounts of food waste all at once. Once the food waste has been broken down, turn the disposal off and let water run for 10-15 seconds to flush out any remaining particles. It usually takes only a few seconds to grind food waste, although it varies. The sound of the disposal will change when there is no more food waste in the grind chamber. Pour a little dish soap inside and let the garbage disposal run for a minute or so with cold water after washing dishes. Run your garbage disposal regularly. Frequent use prevents rust and corrosion, ensures all parts stay moving and prevents obstructions from accumulating. Cut large items into smaller pieces and put them in one at a time instead of pushing down a large amount at once. Borax is a natural sink cleaner and sanitizer that effectively works on odor-causing mold and mildew that accumulates in garbage disposals.